The navigation gadget in Google Earth 4 packs a lot of functionality in a small space. In fact, there are some undocumented features which you may not have discovered. The nav gadget lets you control your view of GE in a number of ways. Did you know you can pan, zoom, rotate, and tilt with the nav gadget? You can also make the gadget itself appear and disappear with a wave of the mouse. Not only that, but you can reset your zoom, tilt and rotation very simply once you know the tricks. Panning Click and hold your mouse on the center gadget - which acts like a joystick. While holding and dragging the mouse it will pan your view. You can also click the little arrows around the center to pan in a specific direction. 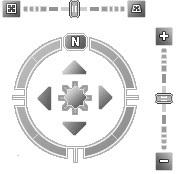 Rotating - Click and drag the outer circle or the "N" button to rotate your view about the compass. The "N" is for north - so if it is on top, then north is up. Trick: - Click on the "N" button once and it will automatically reset to north up. Trick 2: You can also click the "n" key on your keyboard to reset. Zoom - The slider on the right controls your zoom. Drag it up or down to zoom in or out. The farther you drag the slider the faster it zooms. Click the "+" or "-" buttons to zoom in or out at a set speed. Trick: DOUBLE-click on the "+" or "-" buttons to zoom all the way in or out to minimum/maximum. Tilting - The slider on the top controls tilting. Drag it right or left to tilt down or up. The further you drag the slider the faster it tilts. The buttons on either slide let you tilt up or down at a set speed. Trick: DOUBLE-click the buttons on the right or left to tilt all the way up or down at once. Trick 2: you can also hit the "u" key on your keyboard to reset tilt all the way up at once. Trick3: you can hit the "r" key on the keyboard to tilt up and north up at the same time. You can make the nav gadget disappear or appear by using the "View->Show Navigation" menu choices. "Never" makes it stay off, "Always" makes it stay on, "Automatic" is the interesting one. Automatic makes the gadget disappear when not in use. But, there is a trick to make this work: If you have "Automatic" turned on when you first start GE up, you have to move your mouse cursor over the upper right part of the nav gadget and back before it will automatically disappear (I didn't know this myself until recently). Wave the mouse cursor back to the upper right to make it reappear. This same behavior works with the time slider gadget with the same "View" menu choices. You can alternatively show just a compass (smaller than the nav gadget) by choosing the "View->Compass" option. One final favorite little-known trick: You can zoom part way in by double clicking the left mouse button somewhere on the Earth, if you have two or more mouse buttons you can double click the right mouse button and zoom out part way. If you want to learn other interesting things about using Google Earth, check out the "GE Basics" page here at GEB. Also, check out the Using Google Earth blog by a Googler named John Gardiner. And, don't forget the Google Earth User Guide. I will lock ever to North.it´s possible? But the best of all tricks to navigate the Google Earth is: Go buy your own Space Navigator. Gaze around with it, dive into valleys, and then - smoothly - move up and not only see, but also feel the widening horizon. When I recently navigated around Barcelona using the mouse in my office, I tried to do that with the mouse. And realized that this move was not possible neither with keyboard nor with the mouse. Fly upwards, keeping your view horizontally or even slightly tilted down. Even better, smoothly tilt down while you're moving upwards. It's simply amazing to use that 6-axes tool with Google Earth - and no other way to navigate compares to that. You can also hold down your mouse wheel button and move your mouse to rotate and tilt at the same time.